The main dish for the feast of St. Joseph is “a Sardinian pasta ch’i,” one of the most original Sicilian dishes combining completely different elements, blending the sweet and the salty, the typical Sicilian gastronomic philosophy that focuses on the balance between opposites. There is a blue fish in our seas, Sardines, so poor but ever so precious. Embodying the love for our mountains in the spring, there is the green-coloured fennel, with it’s very special taste. There are pine nuts, there are sugary sultanas, there is the salted anchovy. These flavours are enhanced by the deep yellow colour and aroma of the invaluable spice, saffron (used in the tradition of Palermo in this particular dish. Other versions may require using concentrated tomato). All this is combined with the pasta which must be exclusively “maccarruncino u,” which is just a little different from a bucatinoi pasta. It would seem like only small details, but are essential for true connoisseurs. U maccarruncino is a little more difficult to roll with a fork and if tasted with extreme “passion” causes a strange sound effect, “u scruscio”, which for the most refined might look tacky, but is meant in Palermo as a compliment as a real sign of appreciation. The origin of this dish is Arab. Legend has it that it was invented by an Arab cook for his Arab general who landed in Sicily. To feed the troops, he decided to exploit what nature offered him and invented a dish that was enriched over the centuries up to the traditional recipe of today. Both the Romans and Greeks already enriched their dishes with wild fennel. It ‘s also interesting to note the use of pine nuts (highly present in Palermo’s cuisine) which have antiseptic qualities. These were introduced with the aim of avoiding the likely food poisoning which could incur in poor cooking, as the fish and meat were not always fresh or preserved well. 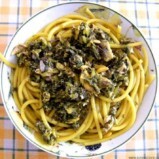 My grandmother, on St. Joseph´s day, always cooked pasta with sardines. She told me that her father, my great-grandfather, advised her on how to cook this very particular and traditional seasoning. When all items are ready “cipudda ‘ngranciata, finucchieddu squaratu, Sardinian and allinguati rosulati, passulina and fussy and zafaranu priparati …” (onion browned, fennel boiled, sardines cleaned, de-boned, cut open and fried, then add the raisins, pine nuts and saffron), assemble in a “tianu” (pan) and then cover with a final layer of sardines placed radially. At this point he told her: “Abbunnavu r’uogghiu and chiuivu tianu cu u u cummuogghiu, accussi you accutturò tuttu without arriminari and vinni troppu bellu ” (with abundant oil added, I cover the pan with the lid, so everything is cooked without stirring and is very tasty). Then, when you remove the lid, the seasoned pasta with sardines seems almost like a timbale, as it does not disperse its scents and flavours, and lies on that beautiful maccarruncinu pasta “ca sata ‘ntu Piattu” and is a delight for the senses. My grandmother says that eating pasta with sardines reminds her of my grandfather, Giuseppe (in English, Joseph.) A great love can never end, for her just to savour what was his favorite pasta makes her feel close to him still. Other typical Sicilian dishes of the day are the “macco of fava beans,” dishes made with artichokes and various soups or soups of St. Joseph with in-season vegetables. And at the end of all these is the unique sweet, the “Sfincia San Giuseppe” that embodies the essence of all Palermitan sweet cakes: the frying, the ricotta, the candied fruit used for decoration, and the Sicilian pistacchio, which gives the combination of sweet and salty that positively “hit the spot,” reminding us of the necessity of maintaining harmony in life. a generous handful of raisins and pine nuts, two sachets of saffron, olive oil, salt and pepper. Pull apart fennel and clean thoroughly. Boil for about twenty minutes in salted water that will serve later for cooking pasta. Drain and chop. De-bone the sardines, remove the head and tail and open them like a book. Then, in a pan, brown the sardines with extra virgin olive oil (one minute per side), drain and set aside. In the same oil, fry the onion, add the fennel, some anchovy fillets, half of the sardines, raisins, pine nuts, salt, pepper and the contents of one saffron sachet dissolved in a tablespoon of the cooking water which was used for the fennel (if you need to, add oil or a little more water). Cook over low heat for about twenty minutes, stirring continuously. Now add the remaining sardines on the surface of the sauce arranging radially, drizzle oil over, close the lid and continue cooking over a low heat for another 5 minutes. Meanwhile, cook “u maccarruncino” (the pasta) in the water used for cooking the fennel. When the pasta is al dente (cooked), drain and toss. If you want you can sprinkle with the “muddica atturrata” (toasted bread crumbs with a little ‘oil).